It is a little known fact that by the time Barnabas and Paul (then still Saul) arrived in Cyprus on their first missionary journey, there was already an established Christian community on the island “by those who had been scattered by the persecution in connection with Stephen” [Acts 11:19], and had been for about a decade, preaching only to the Jews. In actuality, it was from Cyprus and Cyrene (Libya) that early Christians first set out to proselytize to the Greeks of Antioch [Acts 11:20]. Cyprus is an island off the coast of Phoenicia and Cilicia, 148 miles long, 40 wide, and irregular. The highest mountain is Olympus, 7000 ft. Gold, silver, and copper were mined. Its cities were, Salamis, Citium (now Larnaka), and Paphos and many others. Alexander the Great got 120 ships there for his siege of Tyre. It was the birthplace of Barnabas [Acts 6:36] and was visited by Barnabas and Paul [Acts 12]. The pagans worshiped Astarte (Aphrodite or Venus), in a licentious manner. Barnabas and Mark [Acts 15] Cyprians, the people, in 2 Macc. IV.29. Arrival at Larnaca International Airport. Meet, assist and transfer to the hotel. Check-in. Dinner and overnight. Breakfast at the hotel. Today we enjoy a half day sightseeing city tour in Limassol and then driving through citrus groves we arrive at the Kolossi Castle, built by the Crusaders in the 13th century. From there, we continue to the ancient ruins of Curium. There is plenty to see, including the excellently preserved mosaic floor of the “House of Eustolios” and the Greco-Roman amphitheatre, which still hosts performances of Ancient and modern drama. Return back to Limassol. In the afternoon, free time at the hotel. Dinner and overnight. After our breakfast at the hotel, we leave our hotel for an outgoing you will never forget. Passing through picturesque, traditional mountain villages, we shall drive you to the heart of Cyprus. Our first stop is Troodos Square for coffee. We continue to pass just below Mount Olympus, the highest point in Cyprus with a peak of 1950 meters, to experience a spectacular, suburb view of the countryside and the forest stretching below. We proceed via Prodromos to the wealthiest Byzantine Monastery of Kykkos, founded in 1092. There, we visit the church and then Throni where the late President of Cyprus Archbishop Makarios is buried. The view is magnificent! As we proceed to Pedoulas village, mainly a cherry-tree growing area, where you may enjoy your lunch. Our last stop is the very well-known “Wine” village of Omodos and we return to Limassol. Dinner and overnight at the hotel. Breakfast at the hotel. Today we have a full day visiting Nicosia, the capital of Cyprus which is situated in the centre of the island. The first stop is the handicraft centre (traditional folk art) at Strovolos. We proceed to visit the Museum and then we proceed along the Green Line, the Venetian Walls, the Famagusta Gate, the statue of Liberty and on to the Archbishop's Palace to visit the cathedral of St. John and the Byzantine Museum. The tour continues towards the shopping centre and the newly restored "Laiki Gitonia" (an example of an old traditional Cypriot neighborhood) where you will have time for lunch. Return to Limassol. Dinner and overnight at the hotel. Breakfast at the hotel. We drive through the picturesque avocado and citrus plantations of Phassouri to Paphos. On the way, we have a short stop close to Aphrodite's Rock, where according to the legend, Aphrodite (the symbol of Beauty and Love) was born. Next stop is Yeroskipos village where we will visit the church of Saint Paraskevi, a Byzantine building of the 9th century AD., famous for its fresco paintings. Here, we will taste the famous traditional delights "Paphos loukoumia". Then we arrive in the town of Paphos. Situated at the west end of the island, there was a road between Salamis and Paphos. It was the seat of the Roman governor, Sergius Paulus, who “believed” after hearing Paul and Barnabas [Acts 12:12]. Elymas (magician, sorcerer), was struck with blindness (for a reason), as a punishment for deceiving people with his magic. They had a fine temple in honor of Aphrodite (Venus), who was worshiped, and was fabled to have risen from the sea at this place (Homer, Od. VIII. 362). The temple was at a place now called Kuklia, some distance from the new town called Baffa. We pass by the pillar of the apostle Paul and the catacomb of Agia Solomoni. Then, we visit the famous mosaics at the house of Dionyssos (or Roman villa), and the “Tombs of the Kings”. Time for lunch at the picturesque old harbou of Paphos. In the afternoon we visit the Ayios Neofytos monastery. Return to Limassol. Breakfast at the hotel. We visit first the salt lake and the Hala Sultan Mosque. Afterwards we stop by the seafront of Larnaca where you will have time to relax or explore the shops. Our guide will take you for a walk in the old square where you will visit Saint Lazarus cathedral, which stands over a roman cemetery. We will then visit the Byzantine church of Angeloktistos, at Kiti village. On the way back, we visit at the picturesque village of Lefkara, famous for its handmade lace and silverware. Return to the hotel. Dinner and overnight. Breakfast at the hotel. 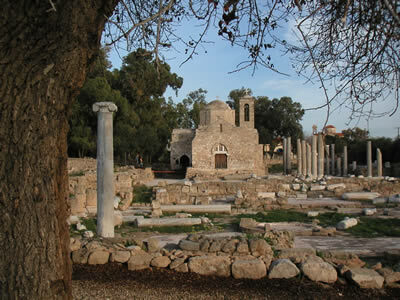 Drive to the seaside town of Famagousta where you will have the possibility to visit the remains of Salamis. Situated on the east end of the island of Cyprus. It was one of the most important city Kingdoms where Hellenic and Roman civilizations have left their mark. Salamis was founded in the 12th century BC by Teucrus, one of the Greek Heroes of the Trojan War. Here, we can also visit the Roman theatre, the well preserved baths and the gymnasium. Visited by Paul and Barnabas on their first missionary journey [Acts 12:5]. There were many Jews in Cyprus, attracted by the copper mines. The ancient city was near the modern Famagousta, by the river Pediaeus, on a plain. Afterwards, we will drive to the old town where we will see the city wall and the Othello tower. We will also see Saint Nicolas Gothic church which is now a mosque. Free time will be given for lunch. We continue our trip towards the so called “Ghost town”. We will stop at a point from where we can see the abandoned town. Dinner and overnight at the hotel. Breakfast at the hotel. Check-out. Transfer to Larnaca International Airport for departure flight. !!!!!!!!! !ASK FOR OUR SPECIAL RATES!!!!!!!!! !